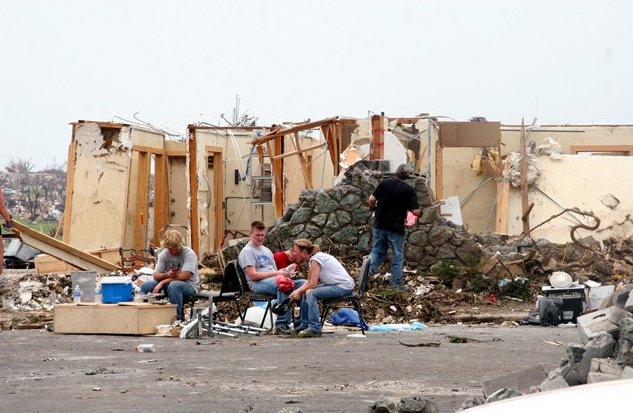 On Sunday evening, May 22, 2011, a massive multi-vortex EF-5 tornado plowed through the southwest Missouri community of about 50,000 residents, killing 156 people and injuring more than 1000. It left a path of almost total destruction six miles long and over half a mile wide. It is now classified as the second deadliest tornado in U.S. history. In the wake of this nearly unprecedented destruction, competition barbecue teams from eight states answered the call to help feed displaced families and emergency personnel, including police, fire and the National Guard. The group, headed by Stan Hays (County Line Smokers), Jeff Stith (Big Creek BBQ) and Will Cleaver (Sticks N Chicks BBQ), was able to serve over 120,000 barbecue meals in less than two weeks during the operation in Joplin. Food was served from our location in the community and delivered to shelters, hospitals, senior living communities and the Humane Society. Volunteers also loaded food into vehicles and delivered directly to families in the impacted areas within the tornado’s footprint. The operation was made possible by many businesses who contributed food and supplies and people from across the country who donated cash. 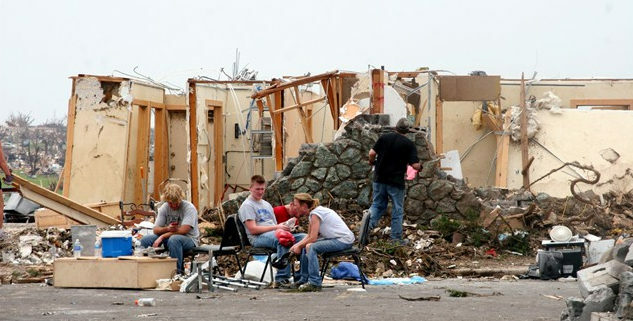 As a result of efforts in Joplin, Operation BBQ Relief was born. The Joplin operation will be used as a model for future disasters such as hurricanes, wildfires, earthquakes, floods and other tornadoes. Aaron Black, Andrew Korbesmeyer, Anna, Mark & Brad Sturdefant, April Hepko, Barbara Whitlock, Beth Bigby, Beth Karriker, Bryan McLarty, Buffie Brinkerhoff, Chet Anderson, Chip Caraway, Chris Early, Chris Mueller, Chrissy Schmidt, Craig & Patty Kidwell, Dan Duncan, Darin Cram, Dave Elliott, Dionn & Gary Lanton, Elizabeth Kratochvil, Eric Westervelt, Frank Cox, Frank Schaffer, Gary & Gerry Benham, Greg & Kristi Powers, Heather Johns, Heather Keith, Jack Karriker, Jake Early, Jana Early, Jason Summers, Jeff Hughes, Jeff Johnson, Jeff Pickman, Jeff, Tammy & Taylor Stith, Jerry Shipe, Jim Altic, Jim Knepper, Jim Rhino, Jim Sturm, Jim & Jerri Bigby, John Buschmann, John Hochscheid, Jon Orr, Jon Stinson, Jon Tupper, Judy Thompson, Justin Ayers, Kathryn Coltrin, Kathy Waller, Kay Brewster, Kaylin Groneman, Kelly Cain, Kimberly Groneman, Kurt Schwab, Larry & Joyce Mickels, Lauren Groneman, Lee Keith, Lee Thompson, Lon Campbell, Lori Graham, Lynda Johnson, Mandy Johnson, Manuel & Dawn Pruneda, Marc Matthews, Mark Ribblett, Mark & Haley Zimmerman, Mathew Amezaga, Michael Curry, Michael Trump, Michelle Higgins, Mike Espey, Nick Early, Nicole & Chad Backermam, Randall & Andrea Heimgartner, Rhonda Ray, Richard Allen, Rick Sage, Robert Kee, Robert (Ed) Taylor, Robert Lee Johnson, Rodney Cramer, Samuel Kratochvil, Sandy Meinders, Scott Seal, Shane Petzold, Sherry Cramer, Stan Hays, Stel Steller, Steve Stealey, Susan Kratochvil, Taylor Johnson, Terry Kratochvil, Tim Bert, Tim Gray, Todd Johns, Troy Enke, Valerie Wilson, Vern Guilford, Walt Coltrin, Will Cleaver. Sam’s Club, OK Foods, Stubbs BBQ, Farmers Insurance, Taylor Farms Smokehouse, Tyson Foods, Hostess, Dolly Madison, BBQr’s Delight, Pepsi, Target, Head Country, Kosmo’s BBQ, Butcher BBQ, Plowboys BBQ, TheSlabs.com, Ott’s, Smoky Mountain Smokers, Oklahoma Joe’s BBQ, Smoke Me BBQ Wood, McCormick Distillery, Bandana’s BBQ, Royal Oak, Kookers Kare, Great Lakes BBQ Association, the employees of Joplin Golden Corral and the employees of Carthage Lowe’s. In addition, many, many people from across the United States sent cash donations to help make this mobilization possible.